Many home garden foods are perishable. This includes leafy vegetables, such as okra, tomatoes, sweet peppers, African eggplants, onions, roots and tubers, and fruits such as mangoes, bananas and papayas. Harvest surpluses of these foods are often wasted because people are not familiar with adequate processing, preservation and storage techniques. Post-harvest losses of vitamin C can be high, especially for green vegetables, which lose substantial amounts of vitamin C after only a few days in storage. Other home garden foods (e.g. legumes and maize) have relatively longer shelf-lives but must be processed and stored properly if they are to remain fit for consumption throughout the dry season. On the other hand, some roots and tubers, such as cassava, do not pose serious preservation or storage problems. If they are left in the ground, the household can harvest them whenever they are needed. A number of practical strategies can be initiated at the household level to increase year-round access to vitamin- and mineral-rich vegetables and fruits. Blanching improves the shelf-life, flavour and appearance of some dried vegetables. Some vegetables should be blanched before drying. Slippery vegetables (e.g. okra) and chillies, onions and garlic are never blanched or boiled. Tree leaves (e.g. baobab) may be blanched or parboiled to soften them before they are dried. Before blanching, freshly harvested leafy vegetables should be washed and sorted to remove the unwanted parts, such as stems and older leaves. There are different methods for blanching leafy vegetables. The food can be briefly boiled, but steaming is preferable, as it minimizes nutrient loss. Place a wire basket over boiling water and steam the vegetables for 1 to 3 minutes, only long enough to heat and soften them slightly. Alternatively, the vegetables can be wrapped in a piece of cloth and placed over a pot of boiling water. Steaming can be done also by using a covered pot containing water about 3 cm deep. Place clean rocks in the pot covered by a piece of matting or some sticks. Place the vegetables that are to be steamed on the covered rocks. Vegetables and fruits can be processed and preserved by drying. Drying preserves food because the microorganisms that spoil food need water to grow. Drying also concentrates a food's nutrients and preserves them for times when fresh food is not available. 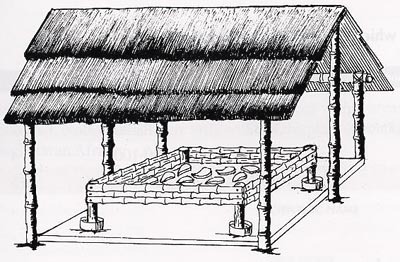 Improved technologies, such as solar dryers, retain higher quantities of vitamins in food than can be retained using the traditional method of sun drying. Surpluses of different home garden vegetables and fruits (e.g. green leafy vegetables, pumpkins, tomatoes, peppers, okra, onions, sweet potatoes, cassava, papayas, mangoes and bananas) can be dried easily when these vegetables and fruits are in season. Sweet fruits such as mangoes, bananas and papayas do not need to be dried as thoroughly as vegetables because their high sugar content acts as a preservative. Dried leaves can be added directly to soups and stews as required. Dried cowpea leaves can be fried, as well as boiled. These are especially tasty and nutritious when they are fried in oil (e.g. red palm oil), crumbled and then sprinkled over maize porridge, sadza or nshima as a relish. Dried fruits and vegetables, such as cassava, sweet potato or banana chips, or slices of mango, pineapple and papaya make excellent snack foods for children. They are delicious, sweet and contain a lot of energy. Although the most widely used method of drying foods in Africa is sun drying, sunlight destroys vitamin A. High temperatures destroy vitamins A and C, as well as some other vitamins. As a consequence, it is better to dry food in the shade. Shade drying requires full air circulation. It should not be undertaken inside conventional buildings but in an open-sided shed purposely built for shade drying. Most foods to be dried are sliced (e.g. peppers, okra, onions, tomatoes, eggplants, yams, sweet potatoes and carrots), as sliced food generally dries faster. The slices should be only about 1 cm thick so that they dry thoroughly and quickly. The food should be placed on mats or trays and well off the ground in order to avoid contamination from dust or soil (see Figure 1). Turn over the slices daily to ensure that the food dries quickly. To store well, the slices should be quite dry. Because of their higher sugar content which acts as a preservative, dry fruits only until they are leathery. Leafy vegetables, such as amaranth, are dried whole because they are thin. Small okra may also be dried whole. Chillies, onions and garlic are often left whole and hung in strands for drying and later storage. Shade drying takes a little longer than sun drying, but it prevents the loss of a food's natural colour and better preserves its vitamins and minerals. This low-cost technology is widely used, both commercially and at the household level. Solar dryers shorten the drying time and better preserve a food's nutrients. A solar dryer is easy to make. Usually a box is used, but many other shapes are possible (e.g. pyramid). The dryer can be made from local materials such as bamboo or cane. To solar dry amaranth leaves, for example, place the leaves in the dryer. The sun heats the solar dryer from above. The air inside the dryer becomes hot, and the moisture in the leaves evaporates into the surrounding air. This warm, moist air rises and escapes through an outlet at the top of the dryer. Fresh air is drawn in through an inlet or holes at the bottom or floor of the dryer. In about four hours, the amaranth leaves are dry and ready for storage in plastic bags or traditional clay pots with lids. Curing protects food from rapid deterioration and consists of hardening the outer layer of the food to be stored (usually roots, tubers and bulbs) by leaving the food in an airy, shady place. As the outer layer of the food dries, a thin layer of protection forms around the food, preventing moulds and microorganisms from entering it. Foods that can be cured include onions, sweet potatoes, Irish potatoes, cassava, pumpkin, yams and taro. Harvest the crop extremely carefully to avoid cutting or bruising it, because cut or bruised foods rot more quickly. Spread the harvest on a flat, dry surface in warm (around 30° to 32°C) and humid (80 to 90 percent) conditions and dry it for a period of four to seven days. The outer skin of the bulb or tuber dries and hardens, and any cuts and bruises are healed. Although the curing process is faster in full sunshine, it is better to shade the tubers against the sun with big leaves, otherwise the relative humidity around the tubers decreases rapidly and the strong heating of the tubers initiates processes that reduce the keeping quality. Consult Table 1 for the appropriate conditions under which to cure different types of vegetables. All dried foods should be stored in sealed airtight containers, such as plastic bags or traditional clay pots with lids, and kept in a cool place. Sunlight negatively affects the quality of dried products. Some dried products, such as bananas, breadfruit, pumpkin and sweet potatoes, can be made into flour. Cured onions or cassava need to be stored in a cool, dry place that is well ventilated. Check the condition of the stored crops regularly and remove any that show signs of decay. Some crops such as roots and tubers are sometimes left in the ground. This is practised in many parts of Africa for potato, sweet potato, yam and cassava. Pits can be used for storing sweet potatoes and other roots, tubers and bulbs. Layers of wood ash are alternated with layers of the stored food. The pit should be dry and lined with dry grass or other suitable material. Small amounts of food (e.g. maize cobs) may be put in baskets that are hung under the roof of a house. Other crops and seeds can also be stored by hanging them in bunches under the roof. The roof of a kitchen is a particularly good place to store seed because it is dry and the smoke from cooking fires protects the seed from weevil attacks. If crops are to be used as planting material, their seeds should be protected from light in order to prevent untimely sprouting.